A comprehensive and detailed PrivateInternetAccess review, looking at their service, website, speeds, support and more. Read our extensive opinion and review of Private Internet Access. An updated PrivateInternetAccess Review from 2015 is available. This week we’re taking a look at one of the biggest players in the market and doing a Privateinternetaccess Review. With figures of 100,000+ worldwide customers being spoken about, PrivateInternetAccess aka PIA is probably one of the largest players in the market. Couple this with prices at the cheaper end of the scale, has PIA compromised on customer satisfaction with their exponential growth? or is the reasoning behind such a large customer base down to their ability to provide what the customer demands… Find out more in our in-depth review. PIA offers only one type of account which is available in a variety of subscription lengths. For the purpose of the review we took a look at this package and made use of it over a 13 day period. The first thing noticeable about the website of PrivateInternetAccess is it looks slightly different to other VPN providers out there. The colour scheme and layout remind me of a software product that you would download which offers a friendly and clean layout, very different to other VPN providers. Various logos of large news organisations and awards are visible on the front page with a medium sized friendly “family” image adorning the top section of the site. The impression given is that PIA is aimed towards the general user and with imaging such as the family on the main page it is clear that the target market and aim of PrivateInternetAccess is to be as open and inviting to all walks of life and not just the hardened computer expert. All of the important information is available on the front page in regard to servers, payment options, services available and the obligatory details regarding what a VPN does and how it can help protect you. It appears as if PIA have all areas covered for the beginner making it an inviting option for those who are new to the VPN world and find the mass of information confusing. From the perspective of a new user it goes to great lengths to ease the process and make you feel at home. The range of packages available is limited and only based on the length of service of which you want to take. This ranges from 1 month at $6.95, 6 months at $35.95 and 12 months at $39.95. At this price point it makes PrivateInternetAccess on the cheaper end of the scale of VPN providers and when taking the yearly package it works out at just $3.33 per month which is unbelievably good value and makes for stiff competition for other providers based on price alone. It appears the package prices are geared towards you taking the yearly service based on the tiny price different between that and the 6 month package. As with any service in life you may want to consider initially buying a 1 month package and then moving on to the yearly service if you find it meets your expectations and needs. At these prices it is definitely worth considering the yearly package if you feel PIA met your needs after a testing it for a month. We found no difficulty in navigating the site and the important areas relating to their terms and policy details are easily located at the footer of the site. PIA have an extensive range of guides and files available to download from their site including both custom software for a range of systems from desktop to mobile and more plus other configuration files and guides covering a large range of programs and devices. PrivateInternetAccess as with any good VPN provider offer connection via OpenVPN, PPTP and L2TP/IPsec. As mentioned in our previous reviews I am a big believer on making use of OpenVPN only when available due to the enhanced security it offers and suggest only making use of PPTP and L2TP/IPsec if these are the only options available to you. For the purpose of the review I made tests of only OpenVPN but the other protocols are available from PIA if required. One of the nice features of PIA is they offer a custom built GUI for making connection on both Windows and Mac systems. I am a big fan of such things especially for the novice as it opens up the world of using a VPN to those less tech-savvy. In a nutshell a custom built GUI is a one-click solution which takes out any of the set-up process and allows you once installed to simply load the program and connect to the required server, it is of huge benefit to those who do not have the ability to copy configuration files to the correct location, etc. The PIA custom program is easy enough to use. Once you have entered your user name and password there are various options which can be changed related to the connection and encryption types, for the novice these could be left as standard and the process for connecting to the server you require is easily accessed by right clicking the notification area icon and selecting the server you require. Click once and you are taken through a process of prompts advising you when you are connected. The notification area icon is also nicely colour coded from red when not connected to green when connected, this makes for ease of view when browsing or doing other tasks. The custom program is not only a good addition for novices but also for more technically knowledgeable users as it is not solely a program for making connection but also for offering extra options in an easy selectable manner. These range from editing your connection type, port and encryption settings with additional features such as DNS and IPv6 Leak Protection. An emergency VPN kill switch is a further feature which will in essence turn off your internet should your connection to the VPN server drop. This is a very handy feature indeed and will stop your IP, location or other details being disclosed accidentally should your VPN connection close unexpectedly. We found the custom program easy to use and would recommend it for ease of use and the ability to take out the leg work for the novice user. More experienced users may also like the benefits of the added features so it is well worth checking out before you skip straight to the “pro” approach. The only minor criticism of the custom program is on our Windows 8 system we did not get the option to automatically add a desktop icon nor are there any standard top right tool bar options such as minimise or quit etc. The window stays on top with no way to close it until Save is clicked which may seem alien when not making any changes to the options. Only a very minor point but these added bells may add some final polish to the overall GUI. We continued our testing using OpenVPN directly. As with our standard reviewing process we made use of PIA for a range of usual internet use related tasks from web browsing to applications such as Skype and online gaming. In general we found the process fast and suffered no noticeable lack of speed or slowdowns. On the very first day of testing we were unable to connect to the French server which was still unavailable 3 hours later, we tested again later in the day and it connected fine. This could of been planned maintenance or another server issue but during this period we could not make a connection via OpenVPN. We had no issues on any of the other servers at the same time and for the rest of the test period we did not encounter any similar issues with all servers being accessible at all times. From our testing we do not think that the downtime of the French server was anything to worry about and the availability of all servers at all other times did not give us any cause for concern or lead us to believe that this was a regular occurrence. We mention this minor disruption only for your knowledge as it was part of our experience. When initially testing, PIA had access in 9 countries making it a medium service based on available countries. One of our gripes was going to be the lack of Asian or Oceania based servers which reduced the reach of the provider to users located in that area of the world but it appears that at some point between us starting to test and ending of testing they introduced a server in Hong Kong. A good start to breaching out towards the eastern market, we hope to see users in that part of the world further covered in future. In addition to the recently added Hong Kong servers, they offer access to servers in the USA, UK, Canada, Switzerland, Netherlands, Sweden, France, Germany and Romania. While they do not offer as bigger range as some other providers there are a good range of countries with some pleasing solutions in more torrent friendly countries such as The Netherlands and Sweden, the TV streaming countries such as the USA and UK and finally countries which are more geared towards privacy such as Switzerland and Hong Kong. We ran some download tests from a handful of servers at both off-peak and on-peak times in the UK. 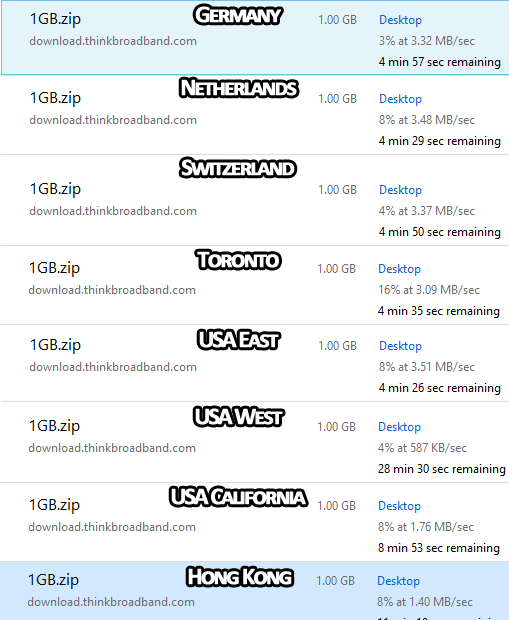 The results came back good with only the US West server having a low download speed at the off-peak time which in fairness could be considered the tail end of Western USA peak time with us being located in the UK. We did struggle a little with the Swedish server achieving a lowly 673 KB/sec at off-peak time downloading directly in browser (Internet Explorer 11). Although our experience is that IE is notoriously bad at downloading directly. To confirm the Swedish result we re-tested via a download manager opening 11 part connections and maxed out our internet speed downloading the same file that struggled in IE11 at 3.62 MB/sec. Our own standard internet connection is 30Mb/s. 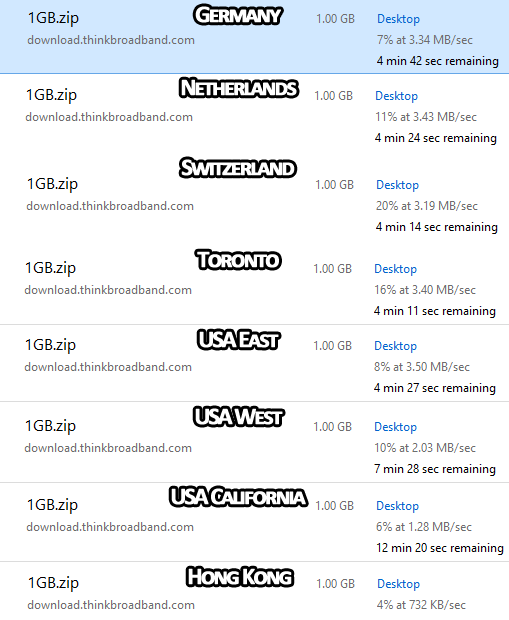 Below are the results of some basic download tests from the UK. As can be seen from the above results the download speeds over a range of servers, even those in far flung locations are very impressive. I was a little concerned that the stack them high and sell them cheap sales technique would impact on the speed and reliability of the servers, for such a bargain price (especially when taking the yearly service) the speeds achieved are excellent and comparable with other decent providers that we have tested in the past. A budget price does definitely not mean a budget service when it comes to PrivateInternetAccess. The complete offering of services allows up to 5 devices to connect simultaneously which is rather a lot compared to other providers. This ensures that you can connect a mass of different gadgets to the service and is pleasing to see that they allow so many at one time. PIA offer a plethora of set up guides and configuration files for a range of devices, alongside the custom programs for Windows and Mac they also have a custom written Android app. We gave the Android app a swift test and had no trouble installing or connecting. The app offers a simple one click connection to the server of your choice and makes connection via OpenVPN for Android. This is a great addition and again as with the computer solutions this makes good headway in to bringing VPN use to the mass market taking the semi-complicated process of configuration files out of the equation for the beginner. We have thoroughly enjoyed making use of the service of PrivateInternetAccess. We found that the speeds achieved at varying times of the day to be of top quality and aside from the fact that we struggled to get good speeds from one of the US based servers there are a handful of other servers based in the US which could be used as an alternative to what appears to be a heavily used server. The range of both custom written programs plus a wealth of guides and configuration files is a welcome sight and allows users from the novice to the expert to make use of the service in a way in which is suitable for themselves. The custom written software appears well thought out and although some added final polish could be applied to the Windows GUI, in general the range of available programs are easy to use and understandable for all abilities. As stated in the review my concern was that due to the fantastic prices of PIA and the size of the user base that in some way the server access and speeds would suffer, I can wholeheartedly state that this was not the case and after a short time of using the service my fears were quickly dispersed. PrivateInternetAccess really offer a top notch service and especially the yearly service price is absolutely unbeatable value, you can really understand why PIA has such a large and loyal user base. Where else can you find a top quality service at a yearly price of under $40? PIA is suitable for both the novice and expert alike and we would definitely recommend them if you’re after a great service with an affordable price. If you’re interested in taking a look at their service then head over to their website using the link below.